So I have been messing around with different types of homemade shampoo and conditioner the past week. It’s been an interesting week to say the least! I started with the one recipe I see most often online-the liquid castile soap + water/tea +essential oils. The first time made my hair feel stripped and dry, so I tried adding a pinch of jojoba oil. This resulted in nasty greasy hair. even when followed by the ever popular apple cider vinegar rinse. The ACV rinse does work well as a detangler, but doesn’t do much to cut the oil. Hrm. So I started looking at other recipes people have made. I tried putting in some baking soda in the shampoo, and making up a conditioner from aloe vera and glycerin and lemon juice. That seemed to help the first use, but day 2 of that resulted in nasty greasy hair again. Bleh! I realize that my hair will be going through a ‘transition’ phase while not using regular shampoo and conditioner, but I am impatient. hehe. So back to the research board. I came across some stores selling ‘shampo bars’ and thought what! What the heck is a shampoo bar? Do you rub your head with a bar of soap? Well…pretty much. But I heard some good reviews in the forums I came across-like no more need for conditioner, hair doesn’t feel greasy, etc. But I wanted to make my own! And I’m not sure I want to start making soap in my kitchen, so I found a nice alternative-hand milling! Basically melt down a bar of soap and add extra ingredients such as different oils, herbs, infusions, essential oils, etc. Basically what you want extra of that may have been made less during the soap making process, or something that wasn’t in there to begin with. I had a nice castile soap made by a local gal that I used half of for some DIY laundry detergent that I decided to use. It took forever to melt down! It took like half and hour and i still had some chunks in it. I added coconut oil, jojoba, sweet almond and grapeseed oil. I added rosemary and lavender and mint essential oils. I also added honey and rice powder. 🙂 I poured it into a wax paper lined bowl and let it sit overnight in the fridge. It came out really soft! My boyfriend says it looks like caramel candy lol! So I tried it out this morning…It felt strange to use a bar of soap on my head, I’m not going to lie. But as I’m sitting here waiting for my hair to dry, I feel no grease, no dryness! 😀 There may be something to these shampoo bars! I’ll update as I use this over the next few days…this may be a great great thing! So in my continuing adventure of a DIY lifestyle, I’ve made chapstick, an aromatherapy neck pillow, and tonight I want to tackle laundry detergent! Especially because I am out…..haha. So I’m scouring the interwebs and I see numerous sites and recipes all for diy detergent..so at least I know there is a ton of support out there for it! Huzzah. Well I notice most of them are very basic…but I know me, and I’m going to have to spice it up a lil bit 😀 so I’ll be attempting to make a powdered, yummy scented well working DIY detergent! I’ll complete it with pics as well. 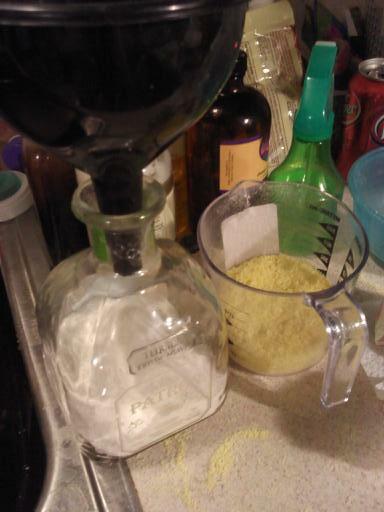 So I started with a basic 1 to 1 to 1 ratio of borax, washing soda, and grated soap (fels naptha). Oh I also tossed in some lovely Oxy Clean too for a cleaning boost. The grating took the longest 😛 I do recommend the finest grater you have, or and electric grater. Would save you plenty o time. Woo! 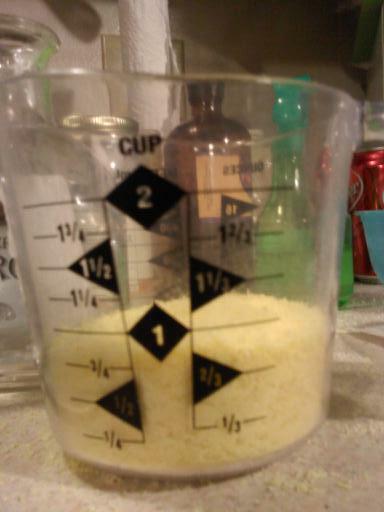 1 cup of grated soap. Devin didn’t much care for the smell of it I don’t think. I thought it was strong but it seemed familiar..kind of like grandma’s old soap or something. 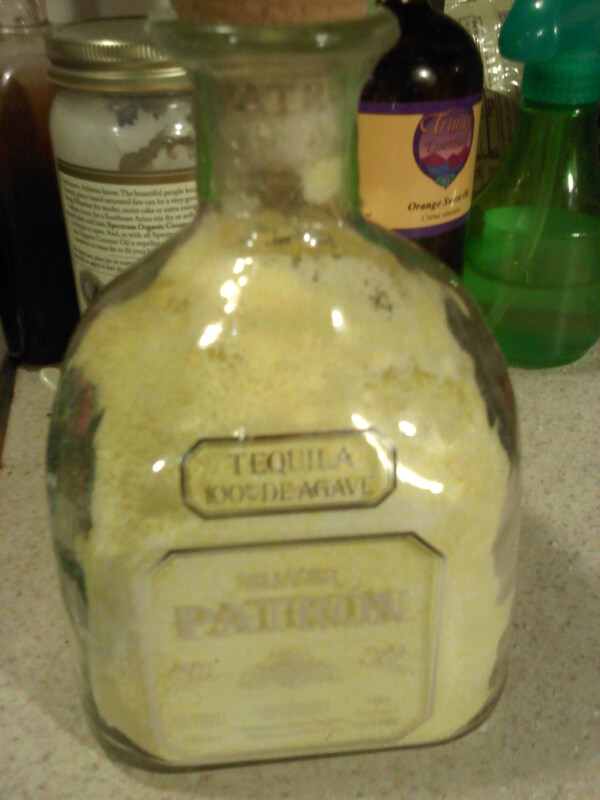 Anywho, I used an old Petron bottle to mix this all in. Fun way to recycle! 🙂 I put in half of each ingredient in at a time, then shook like crazy, so as to evenly mix everything in my bottle. Almost done! About halfway through shifting and shaking and dancing for the baby, I added some essential oils for scent…some lavender, jasmine and orange. Mmmmmm. Shake shake shake. shake shake shakeshakeshakeshake…. Right now it’s washing some towels for a test run! Woo. I also threw in a downy ball containing some white vinegar with a few drops of oil for scent. 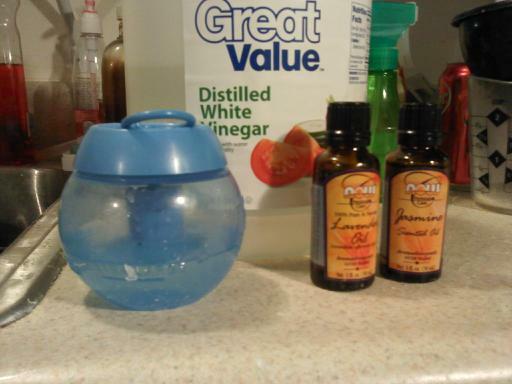 I’ve always been a fan of white vinegar for rinse cycle…No it does not make your clothes smell like vinegar. I use it on baby’s cloth diapes and it works awesome. Hmm I just realized I didn’t put in any baking soda…whoopsie! hehe o well. Should work well on it’s own, but I’ll add that if I find it’s not cleaning well! Annnnnnnd now for the results! Conclusion: I dig it. Totally. I’ll probably play around with the ingredients a bit more until I get near perfection in terms of cleaning power and smell 🙂 If you don’t like the fels naptha purely for smell don’t worry, it doesn’t seem to stick around. Sweet! Next post: DIY toothpaste…and toothpaste that will help protect your teeth, not just make em sparkly clean!